As a person who has been injured frequently and that has had to attend physical therapy for months, I’ve always looked for ways to make my experience more fun while receiving the best care and exercises available for my injury. heaLED reacts to the contraction of muscles in your arm and provides different light sequences and sounds for different motions. We programmed two Adafruit Neopixel rings using the Arduino IDE and the Arduino Uno to interact with motions from the Myo. We used the Myoduino and Adafruit Neopixel libraries and the built-in muscle contraction-tracking technology of the Myo Gesture Control Armband to control the colors and patterns displayed on the Neopixel rings. Later, we added the buzzer to correspond with the Neopixels’ changing colors. From these components, heaLED was born. We initially had difficulty connecting the Myo band to the Arduino Uno. Later, we ran into difficulties with sound causing a delay between the interactions with motion and lights. Everything! 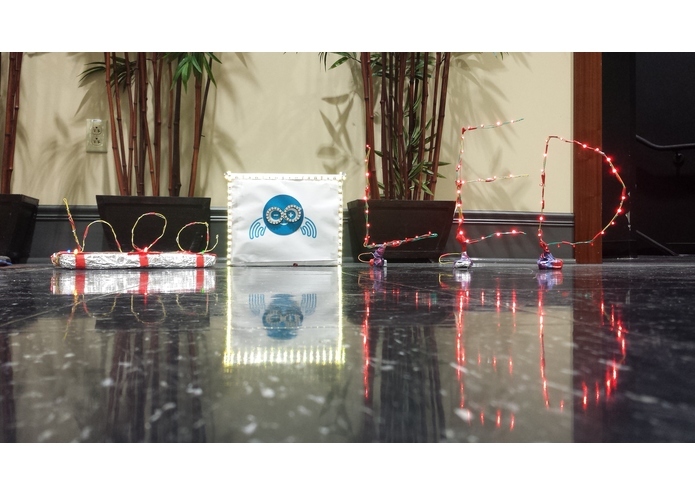 We are proud to have learned to use the Myo band and how to work in the Arduino IDE. Also, getting the sound to work without a major delay. We learned more about soldering, constructing circuits, working with the Myo band, and connecting the Myo band to the Arduino Uno. We would like to expand heaLED by creating games that more accurately show when the user is performing the motions required by their physical therapy correctly. Future iterations of heaLED would recognize a wider range of motions (compared to the five that are currently recognized) and be wireless (perhaps using a bluetooth-enabled Arduino board or a Raspberry Pi). Also, we would like to get rid of the minor delays between the sound, light, and motion.